Filed to: life on europa?Filed to: life on europa? Our Solar System has its own Hoth: Europa, the ice-covered Jovian moon where the existence of alien life hasn’t been ruled out. Unlike on Hoth, where life thrives on the icy surface, life on Europa would thrive in the ocean beneath its frigid surface—but of evidence for it might be just beyond the reach of our experiments. 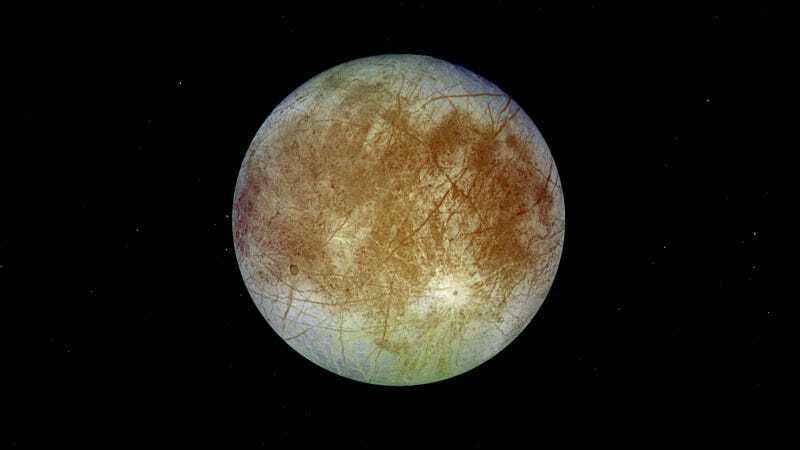 Using past data of how amino acids can survive radiation when frozen in ice, along with data about Europa’s harshest radiation environments, the team figured out where the amino acids would most likely survive. Life hunters might find biosignatures 10 centimeters below the surface, albeit in reduced concentration, anywhere on the planet, the researchers write. But they could increase their chances should they analyze younger ice (as in, 10 million years old) in lower-radiation locations. Such ice would exist in Europa’s mid-to-high altitudes, further from its equator, where the moon points away from Jupiter, the researchers write.